British travellers that want to get a stress-free start to their holidays should avoid the busier airports in London and try to find a regional alternative instead, at least according to a survey that ranked 15 of the UK’s airports based on how long visitors are waiting for their baggage, how easy it is to check in, cleanliness, and ability to access the internet. The poll was conducted by the travel comparison website Cheapflights.co.uk. Things don’t look good for London, with the airports in and around the city making up most of the bottom rankings. Heathrow, Gatwick, Stanstead, and Luton are all low scorers. Luton is actually considered to be one of the worst airports in the UK overall. Scottish airports, on the other hand, ranked higher and get a lot of praise from passengers. The top five airports were Newcastle, Edinburgh, Liverpool, Cardiff, and Glasgow, with Luton coming in dead last at 15. The scores proved particularly damning for the aforementioned Luton airport. Not only did it rank dead last, but it was ranked worst in 11 of 12 categories – including bar and restaurant selection, toilets, staff friendliness, facilities for families, and shopping opportunities. Luton was only able to come in second-worst for just one category – that of Wi-Fi access. Stansted came in last place for this category, saving Luton from complete shame. On the other end of the spectrum, the poll appears to be a massive vote of confidence for Newcastle airport, which has been ranked first in terms of customer satisfaction. Newcastle came first in 6 of 15 sub-categories (toilets, cleanliness, family-friendliness, check-in process, lounges, and passport control) along the way. Edinburgh came in second overall and was second-best for three categories. Liverpool came third overall and was best in two categories. Cardiff was fourth overall and ranked best for three categories. Finally, Glasgow came in fifth and ranked third best for four categories. The poll appears to show that regional airports are big hits with travellers. Large airports tend to fail on delivering consistently positive passenger experiences. Bigger doesn’t always mean better, and having more choice doesn’t always result in higher satisfaction levels. Of course, the problems associated with Luton could be because of how many people pass through it. With all of the people passing through there’s sure to be some bottlenecking at passport and security check points. Even so, the problems with the cleanliness and toilet facilities at airports such as Gatwick and Stansted can be considered matters of concern. 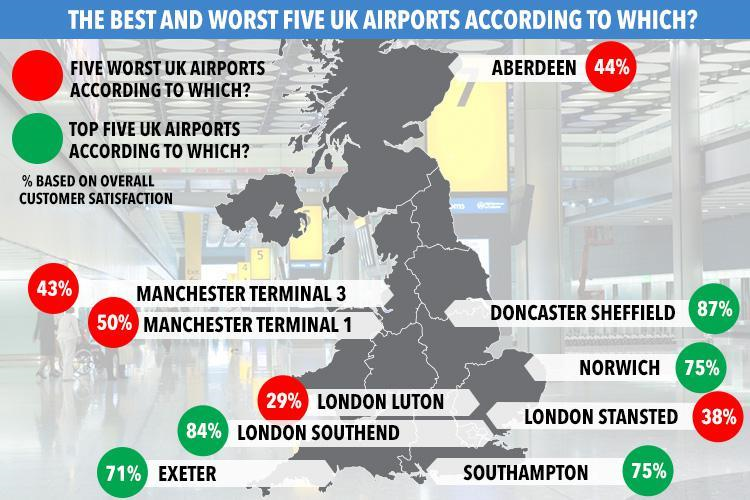 The results of the survey came from quizzing 2,550 British adults that had used one of the airports in question during the past year. The people who used smaller regional airports – with lower volumes of human traffic – found they had a less stressful experience. So the choice is clear; when choosing which airport to fly from this summer, aim to find a regional airport and avoid the big names.